I have always used ‘screencasts’ in my classes ever since I purchased my very first iPad. 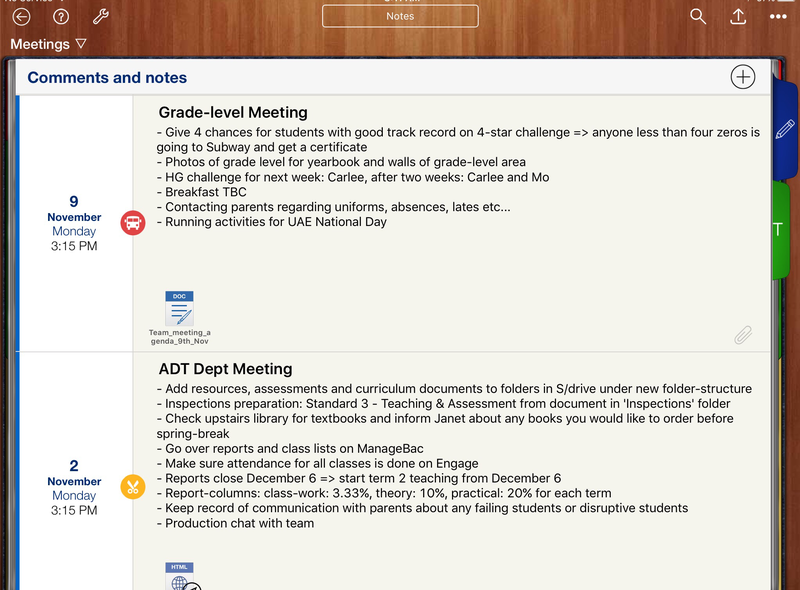 I remember back in the good ol’days (2011 :P), when I purchased my first iPad 2 and used the ‘ShowMe‘ app to create revision screencasts for my humanities students and my drama classes too (examples of which can be found here: http://www.showme.com/user15405#ShowMes). Then I came across ExplainEverything, which is basically an interactive whiteboard on steroids! 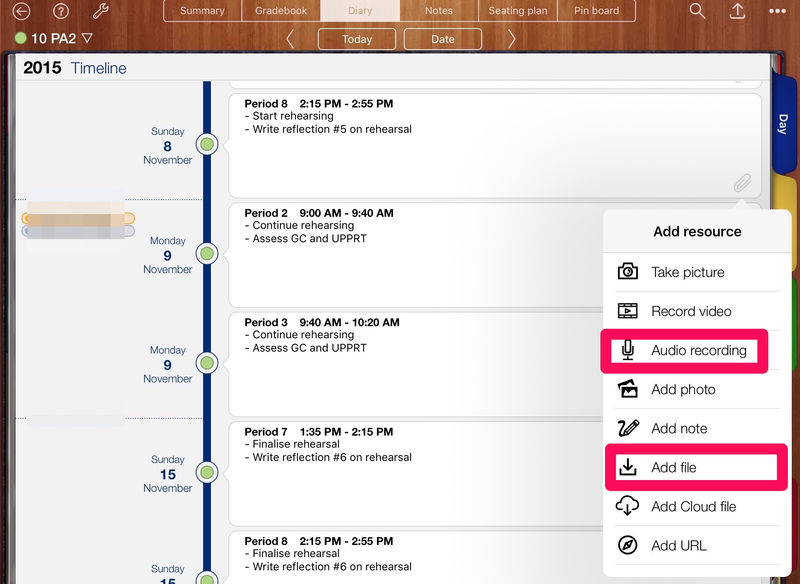 I would import my PowerPoints into the app, and annotate over them while recording my voice, then export the videos for students to revise, and make them accessible via Edmodo or iTunesU or whatever LMS I was using at the time. However, I have always wanted to flip my classroom. I have always wanted to create these screencasts to actually teach the content, as opposed to just revise content already taught in class. I was just scared. I was worried the students wouldn’t watch the videos. I was worried they wouldn’t understand. I was worried if I added a Google Form quiz or some tool for formative assessment that they just wouldn’t do it. I had many worries and many fears! 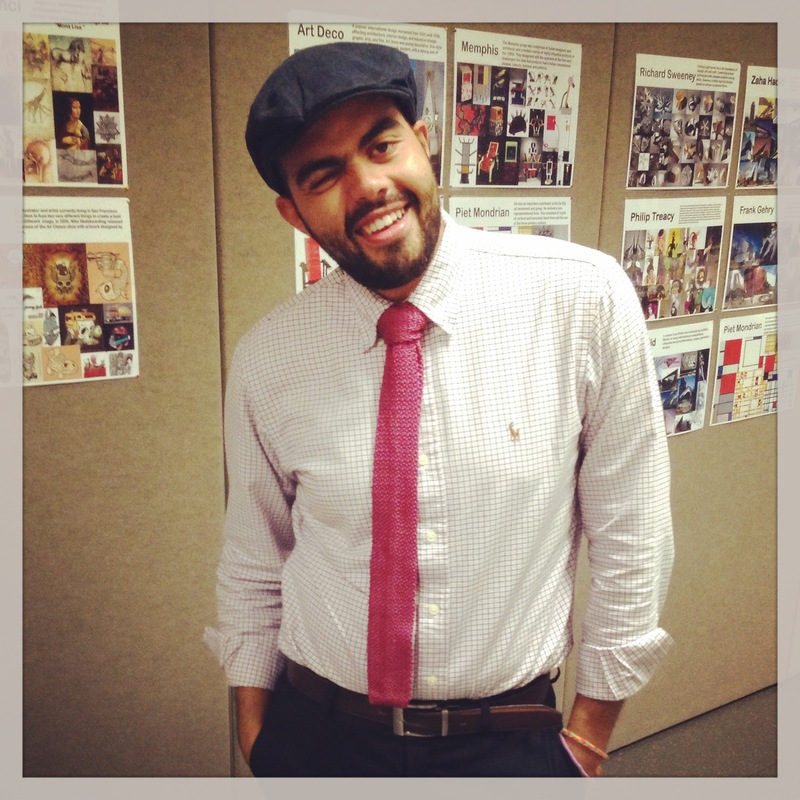 Then I came across Educanon.com! I fell in love! EduCanon allows you to embed quiz questions in your videos, whether multiple choice or true/false, or short-answer, or fill-in-the-blank, or even just reflective pauses! My favorite thing about it: it integrates seamlessly with Edmodo, and you can import your classes directly from Edmodo, no additional student sign-up required (one less password for those password-burdened teens to remember!). 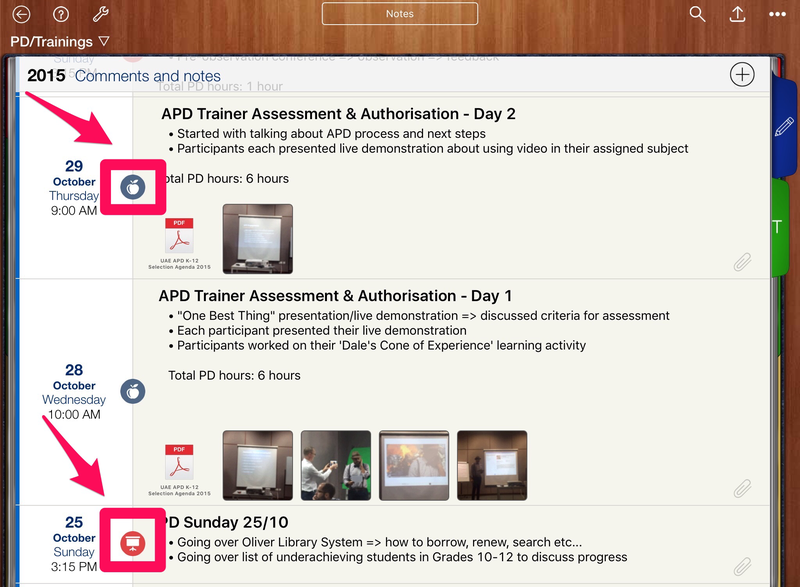 Basically, I still use ExplainEverything to create my screencasts, then upload them onto my Youtube channel. I would then use the Youtube link to import the video into EduCanon and voila: interactive video with embedded formative assessment done! I would then just notify the students that the new video is up and sit with my popcorn in front of the screen monitoring their grades (as I have nothing better to do :P). iDoceo: work smarter, not harder? So, up until this current academic year, I have always taught drama in schools that use a ‘rotations’ system. 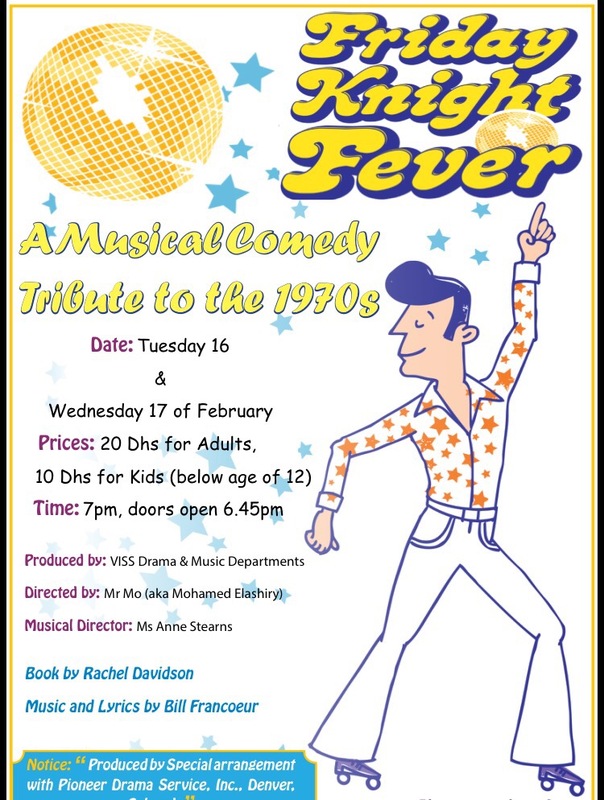 This means that in Grades 7 & 8, where drama is compulsory, the subject would be timetabled for one term only per class, so that the classes ‘rotate’ around the Arts, Music and Design/Tech subjects. So, the most number of grade 7 classes I had at a time has been two, and the same for grade 8. However, this year the school decided to get rid of the ‘rotations’ system, and timetable every class for the whole year, just less frequently. So instead of seeing a Grade 7 class for one term but three doubles a fortnight (we have fortnight-timetables), I would see all Grade 7 classes for the whole year for one double-period a fortnight, which means I teach them for a longer time period just less intensively. One of the challenges that new system brought for me was that automatically the number of classes I had to teach effectively doubled (last year I had 8 classes maximum per term, this year I have 16!). Additionally, suddenly it became a real challenge to stay organised and on-top of each class’ lesson-planning, assessment and documentation. That was until I was introduced to iDoceo… Now I don’t work for iDoceo and I do not receive a commission for what-effectively-sounds-like-a-promotion, but truly iDoceo changed my life! OK, I may be a little bit melodramatic there (I’m a drama teacher so I’m allowed), but seriously iDoceo made my job much much easier! 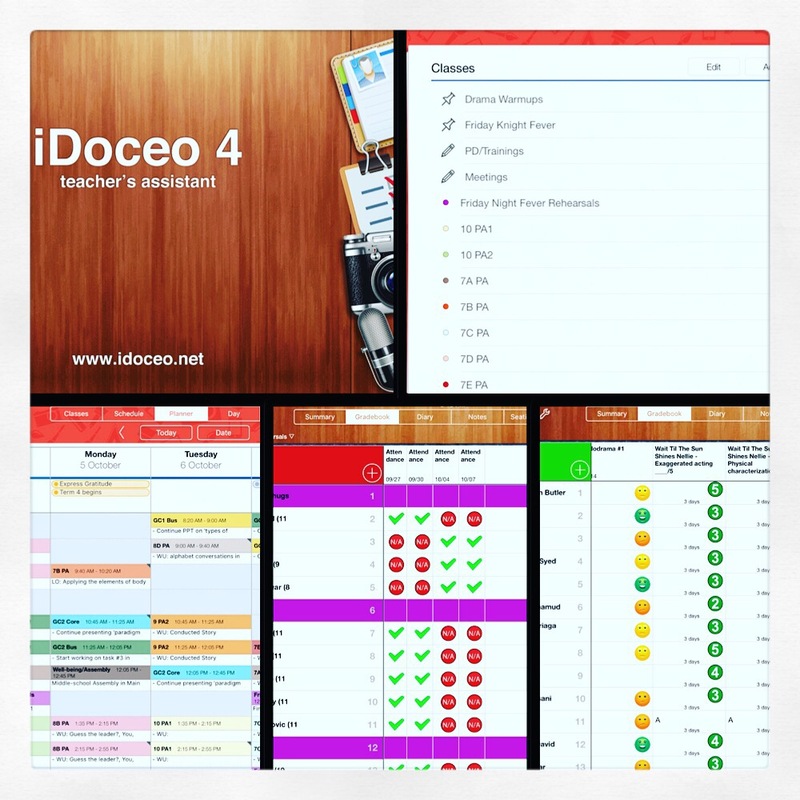 IDoceo is essentially a Swiss-army knife for teachers, it’s a lesson-planner, calendar, to-do-list, gradebook, seating plan organiser, class-notes-collector and resource folder all in ONE APP! Wow! 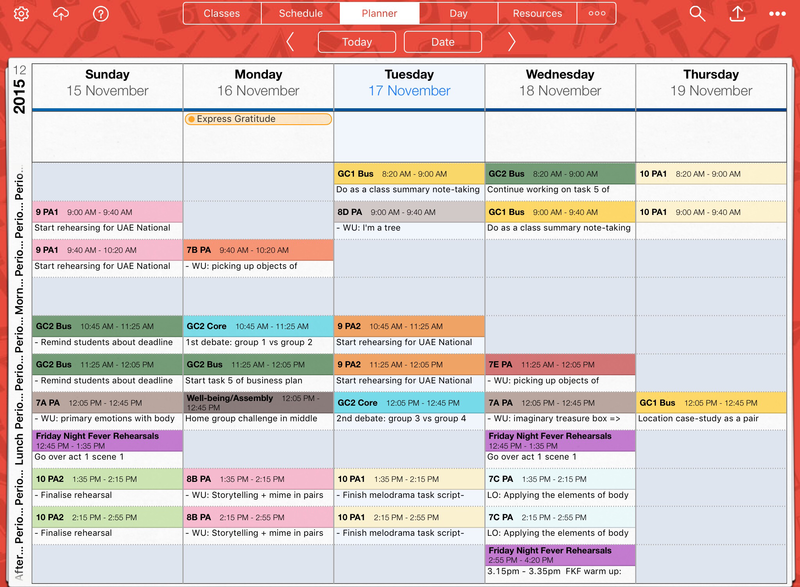 One of the biggest advantages of the iDoceo planner is that it is fully customisable: days of working week (we work Sunday to Thursday), times of periods/lessons, week numbers in each term etc… Once I import all my class lists and enter my timetable in the ‘Schedule’, the ‘Planner’ is good to go! I love that I can see a visual snapshot of all my lessons for the week at once, and also pinch the screen outwards to zoom and make it look bigger, or pinch it inwards to make it fit on the screen. 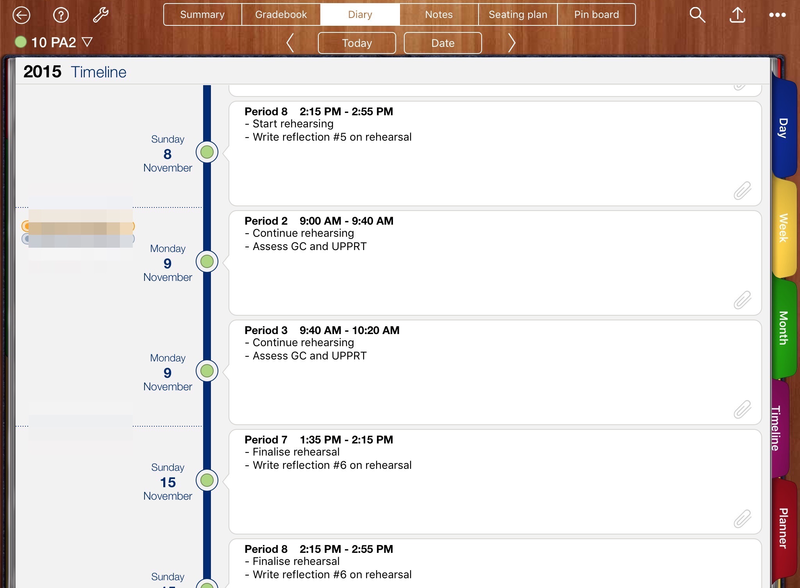 The planner can also be viewed in weekly or daily mode. 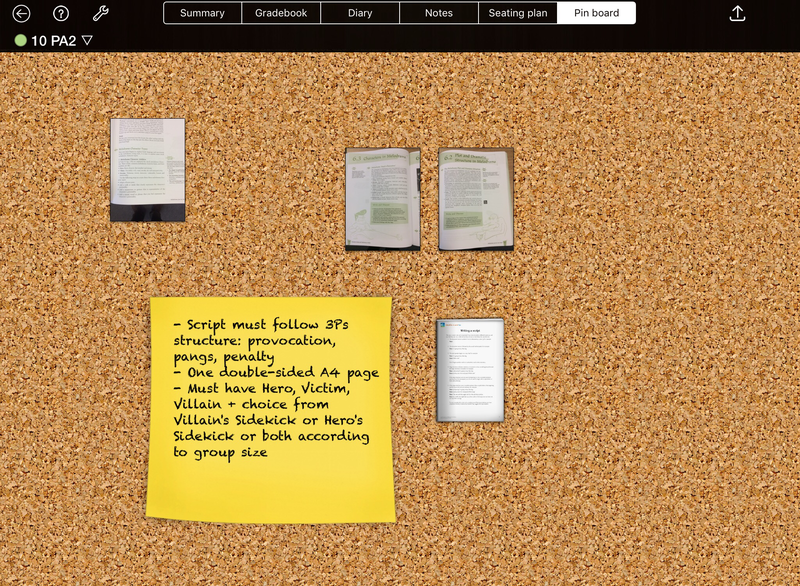 As shown in the image, you can see the I have two ‘Pinboards’ for collecting resources called ‘Drama Warmups’ and ‘Friday Knight Fever’ (that’s our musical production for this year), I also have two ‘Notebooks’: one for documenting ‘PD/Trainings’, and one for documenting ‘Meetings’. Then I have all my classes listed, and each class has a different colour. At the right is my ‘Reminders’ list. 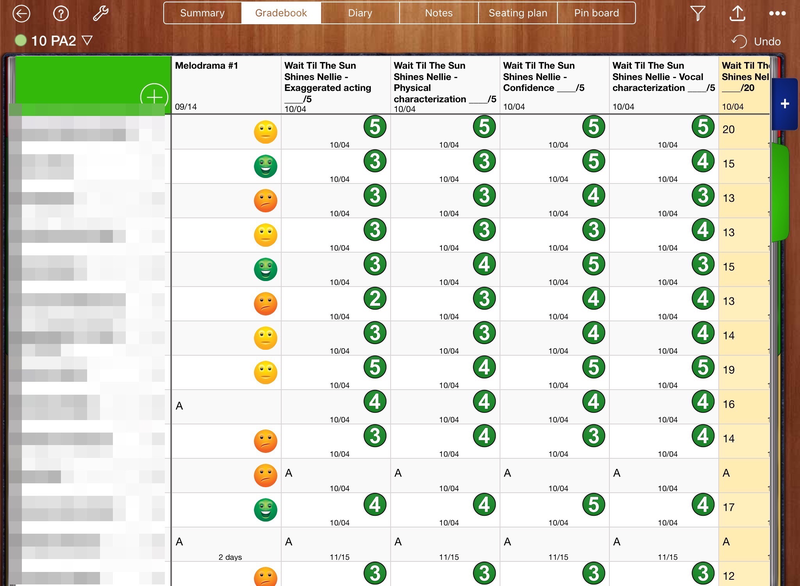 I love the iDoceo ‘Gradebook’! You can create as many columns and tabs as you want, you can use numbers, text and icons like cute smiley faces! You can also perform calculations, just like an Excel spreadsheet! 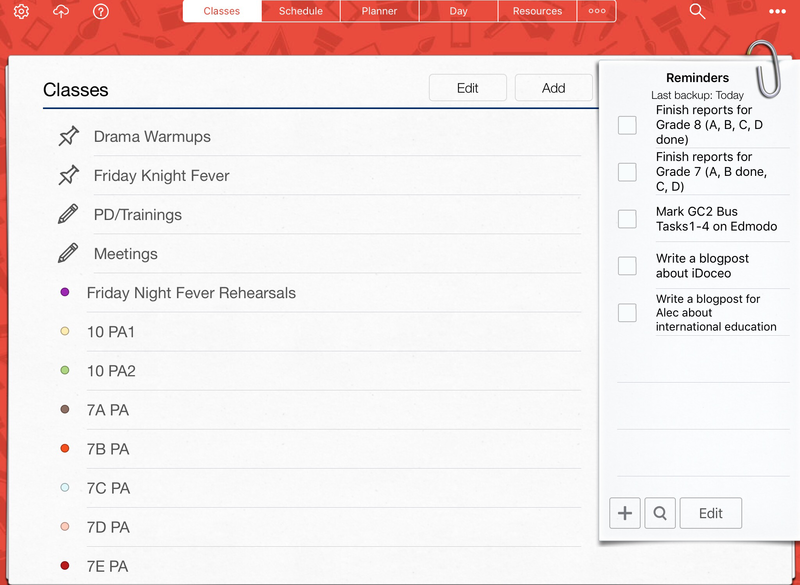 The ‘Gradebook’ feature in iDoceo also allows creating ‘Attendance’ columns, which is really most useful for me during rehearsals for our musical production this year! 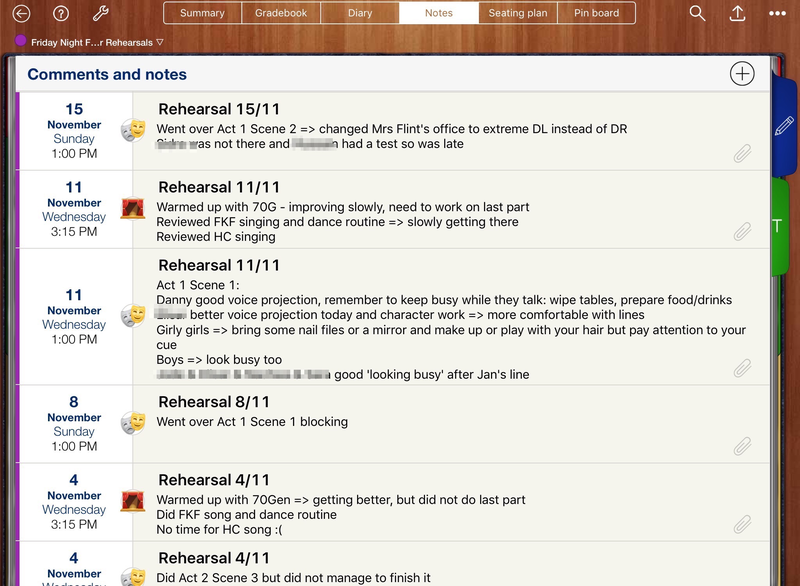 In the iDoceo ‘Classes’ tab, each class also has a ‘Diary’ where I use to reflect on my lessons or rehearsals for the production! Again you can attach voice notes and anything from GoogleDrive/Dropbox. The ‘Seating Plan’ feature is also really cool. 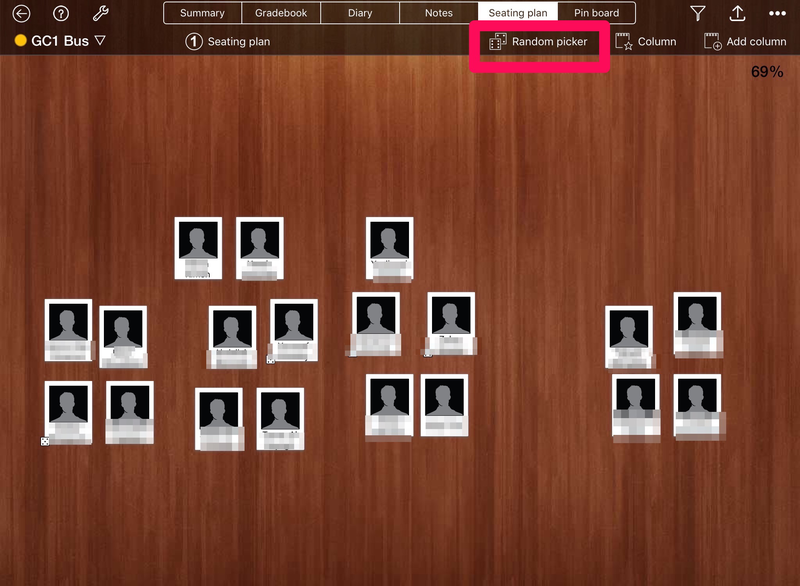 The seating plan is automatically populated with the students’ names once you import the class-list, then you just drag and drop where you want them to sit. There’s also a cool ‘random-picker’ feature which can be useful for discussions in my Business Studies classes. The last feature of the ‘Classes’ tab is the ‘Pin Board’. You can pin pretty much anything on the pin board: files from GoogleDrive/Dropbox, photos from camera roll, videos, links, voice notes and much more. It’s really a great resource collection-board for each class! 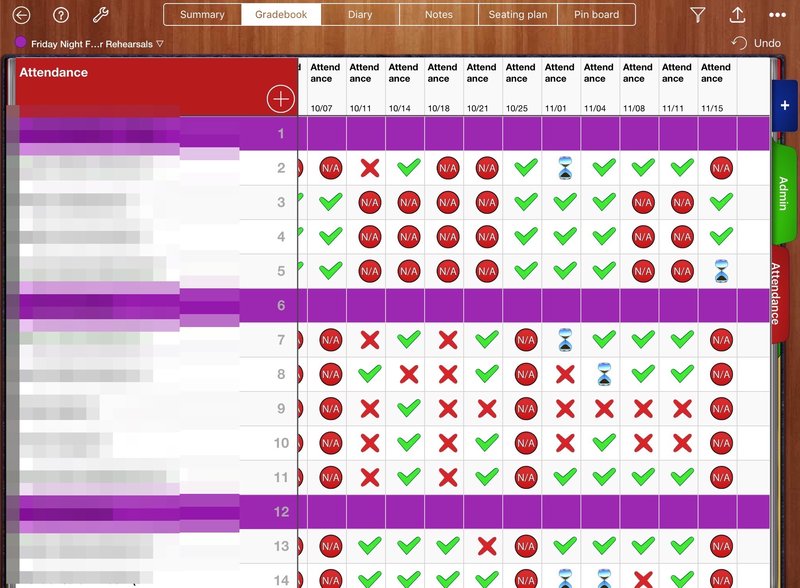 So ladies & gentlemen, I basically use iDoceo as my lesson-planner, class resource folder, attendance-checker, gradebook, notebooks for notes/reflections about classes, notebooks for documenting PD and meetings, seating plans organiser, student random-picker, class pin-board, and so much more! 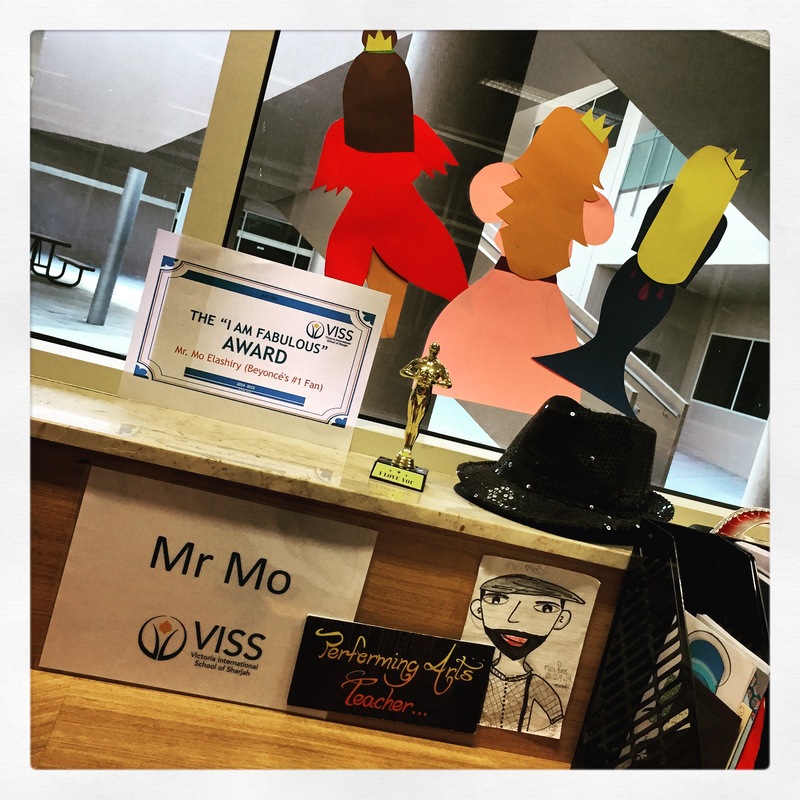 I told you it really is a Swiss Army-Knife of tools for helping a teacher stay organised and basically work smarter, not harder! 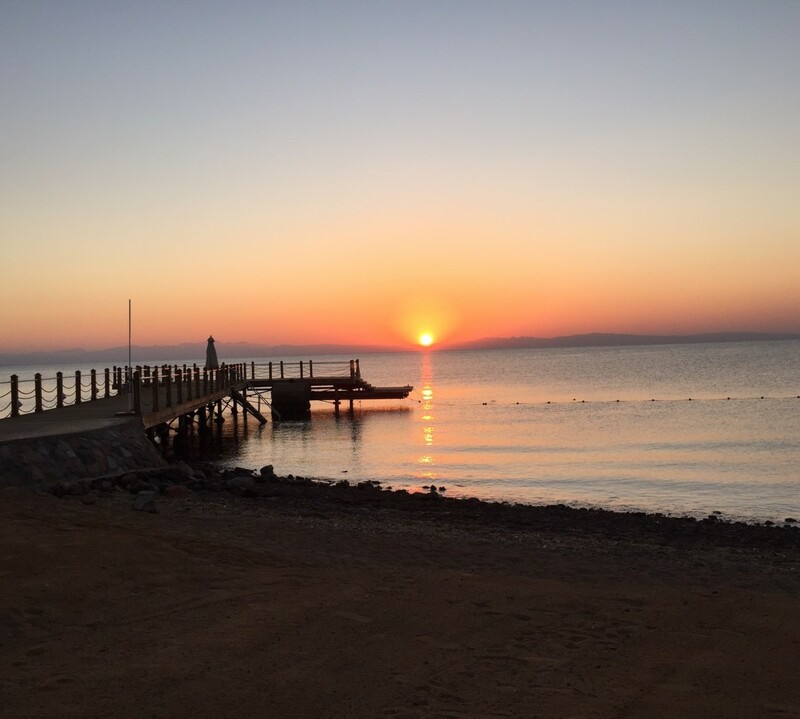 Reflection: an important life-skill to teach? John Dewey wrote: “We do not learn from experience, we learn from reflecting on experience”. I couldn't agree more with this statement. 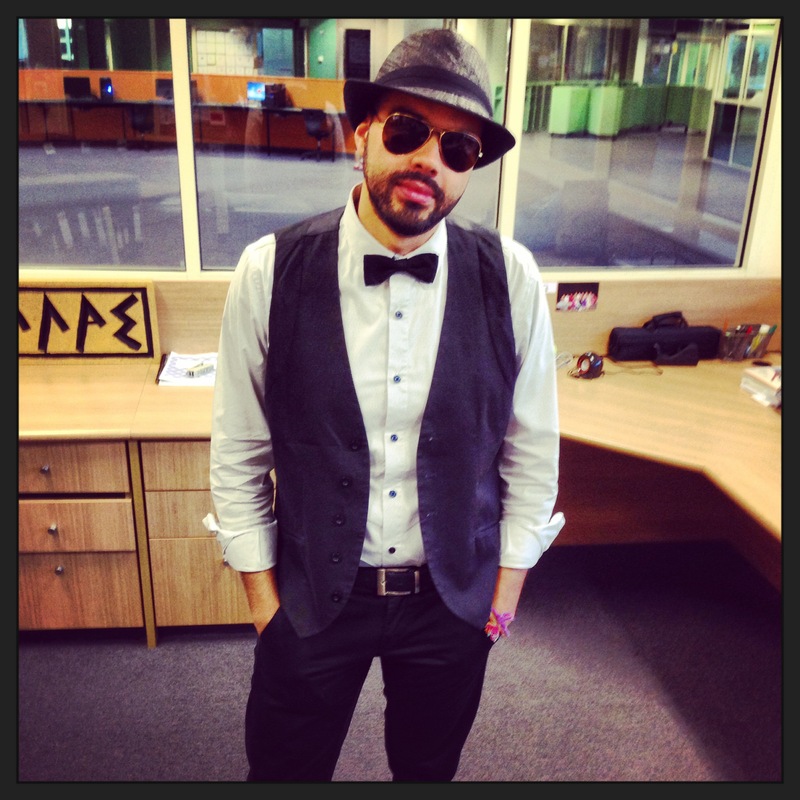 Being a performing arts/drama teacher, reflection plays a very important role in my subject and in my classroom. In fact, when I was teaching IB/MYP Performing Arts, 'Reflection & Evaluation' was a whole criterion of assessment on its own. In my classroom, I always tell my students that there are seven main 'buzzwords' under reflection: Progress, Challenges, Easies, Strengths, Weaknesses, Improve, and Feedback. 1- What is your Progress? 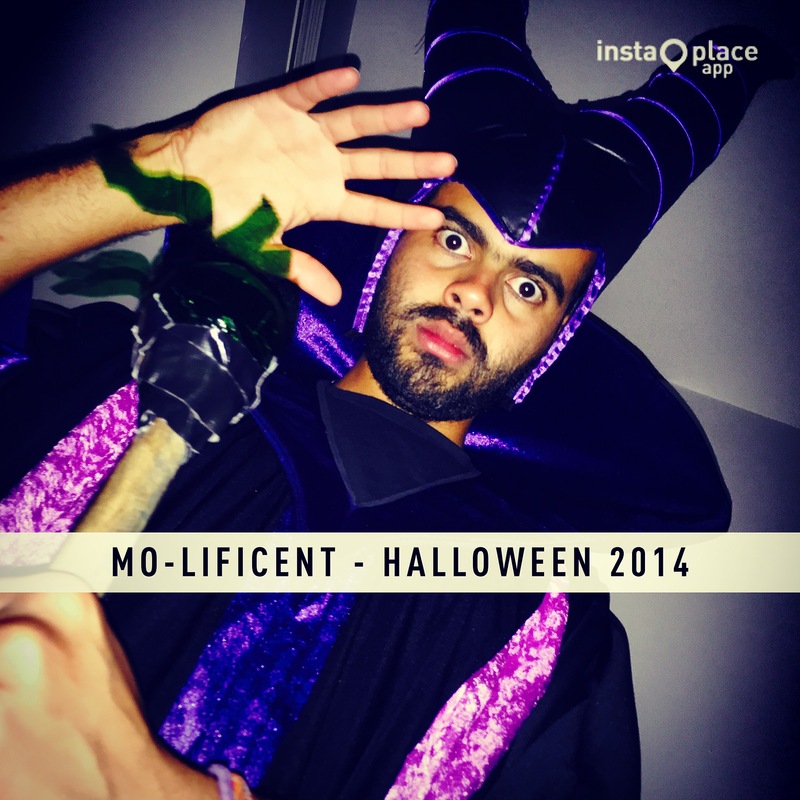 2- What Challenges did you face? How did you overcome those challenges? 3- What was Easy about the task/process? Why was this easy? 4- What are your Strengths? 5- What are your Weaknesses? 6- What do you need to Improve on? 7- What Feedback did you receive from your teacher/peers? What is your response to this feedback and how can you use it constructively? 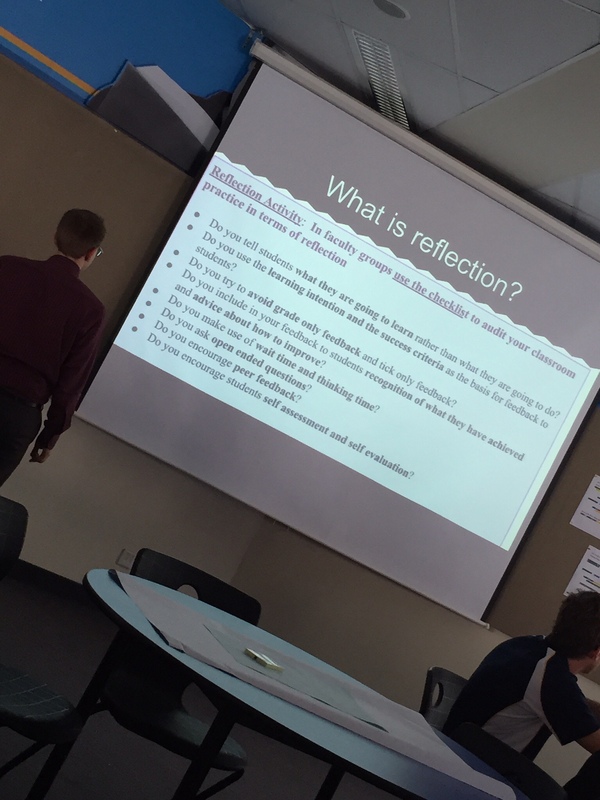 A few weeks ago, we were given a staff training/PD about reflection in our classrooms. The photo used in this post was one I snapped of a slide from the PowerPoint used. It's a checklist to help the teacher 'audit' their use of reflection in their classroom practice. 1- Do I tell the students what they're going to learn rather than what they're going to do? I always post the lesson's learning objectives and learning activities up on the whiteboard at the beginning of the lesson. However, my learning objectives can sometimes be more geared towards what the students are going to do, rather than learn. For example, sometimes I may post this as a learning objective: apply rehearsal strategies to rehearse for our performance, or perform our scene and give/receive feedback. I may need to rethink the wording of my learning objectives, according to this audit. I usually base my learning objectives on action verbs along the Bloom's Taxonomy. 2- Do I use the learning intention and success criteria as the basis for feedback to students? I try to do that whenever I can. For example, if the learning intention is apply rehearsal strategies to rehearse for our performance, I would definitely have a debriefing with the students about the different rehearsal strategies that they used and which ones were effective or not so effective. If the learning objective is apply the elements of mime through creating a short mime scene, we would base our feedback on the performances on the elements of mime explored through the class. 3- Do I try to avoid grade only feedback and tick only feedback? Absolutely! In a subject like drama/performing-arts, it is very important to give clear and specific feedback about students' work. I make use of peer-feedback sessions after performances, checklists for self- and peer-assessments, rubrics and conferencing with students in order to give them meaningful feedback on what they did well and where they can improve. 4- Do I include in my feedback to students recognition of what they have achieved and advice about how to improve? 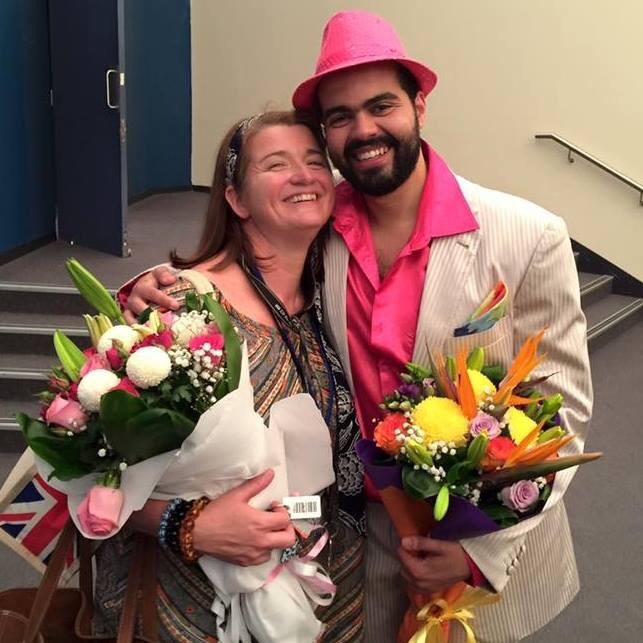 Yes, in my drama classroom, during the feedback sessions after every performance, students give each other positive comments (something they liked about the performance), as well as useful suggestions for improvements. I also model giving constructive feedback by doing the same. I also provide the students with sentence starters for positive comments ('I liked…') and for useful suggestions ('Next time I would suggest…'). 5- Do I make use of wait time and thinking time? I try my best to include as many students as possible in whole-group discussions. Wait-time or think-time is very useful because it allows students who may be hesitant a little bit more time to think and formulate their responses. I believe I make good use of think-time with the younger students, but may need to use it more with the older ones too. 6- Do I ask open-ended questions? This is one area where I still have lots of room for improvement. I do admit to sometimes using questioning to lead students to the answers that I want to hear. I believe I should make more use of open-ended questions to encourage critical thinking and discussion. 7- Do I encourage peer feedback? Absolutely! In the drama classroom, we always have peer feedback sessions after every performance, and sometimes during rehearsals as well. Students give each other oral feedback, and sometimes fill out peer-assessment checklists or write up peer evaluations. I also make use of it sometimes in my humanities classes where students read each other's essays and give each other feedback during the drafting phase, or where students comment on each other's oral presentations. 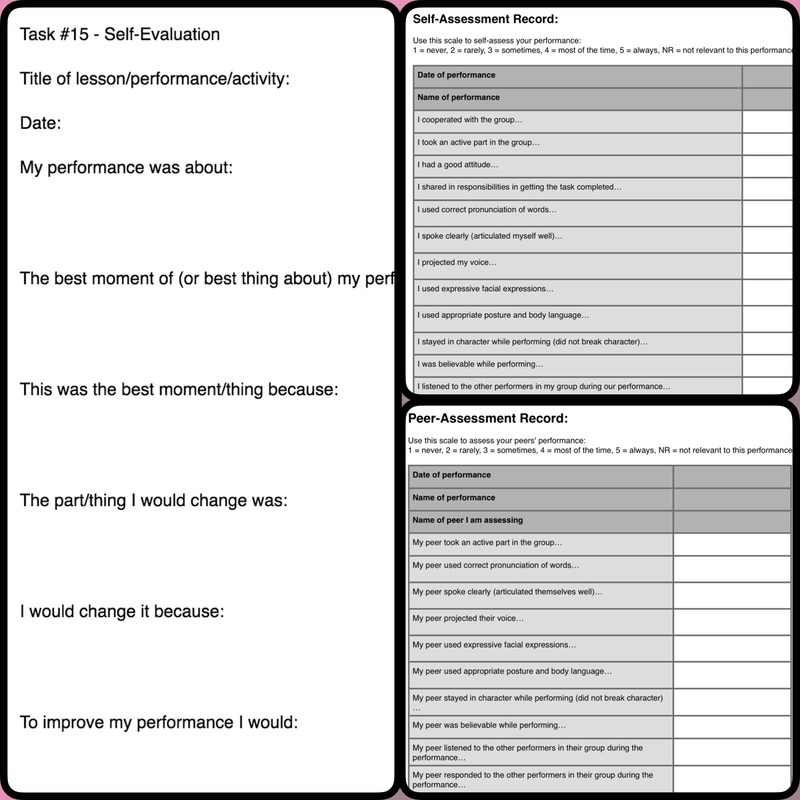 8- Do I encourage student self-assessment and self-evaluation? Definitely! 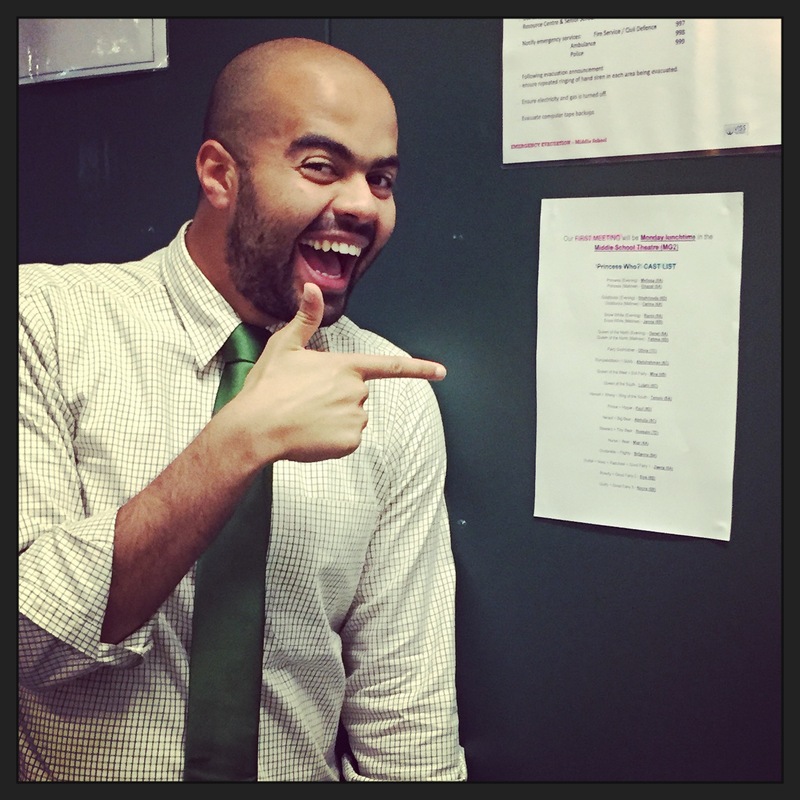 In the drama classroom, students watch their performances (as performances are filmed to be added to their electronic portfolios), and then fill out a self-assessment checklist and write up a self-evaluation about their scene. In my humanities classroom, students also self-assess their own essays using rubrics and checklists to help me with the grading process. To conclude, according to this audit, I believe the main areas for improvement in how I use student reflection in my classroom practice is by asking more open-ended questions; trying to reframe my learning objectives more as what students are going to learn, rather than do; and making more use of think-time with my older students.